100km cycling event starting from Maidenhead, Riverside Gardens. Controls at PANGBOURNE, plus 3 information controls. 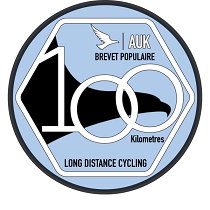 Entry on the day at �7 for members of AUK or CTC, �10 for others. Bring exact change please. The first 48k to Theale is a flat, fast ride through the Thames Valley. The climbs begin after Theale, short and sharp to Bradfield, bigger after crossing the Thames, where it's up and down through the Chilterns. The refreshment break is at Pangbourne. After the Alpaca farm across the Thames from Pangbourne, it's a climb to Goring Heath, followed by climbs from Middle Assendon, Skirmett to Frieth and a final climb on Winter Hill. Children 13+ accepted but they should be keen, strong riders. Limited parking at the venue - it's cheaper if you carry on along the Thames 700m North. If you intend coming by train check first as engineering works could impact your journey. There is extra information on the ride including routesheet and GPS options on the ride's website.